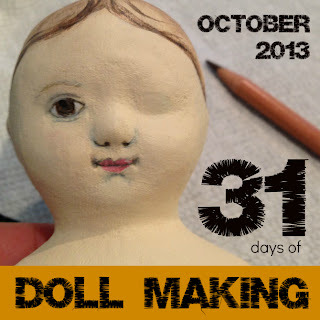 October 1st is the beginning of the 31 Days of Doll Making challenge. I hope some of you will join in with me on that! This 31 Days Blogging Challenge is hosted by Nesting Place. There are lots of people writing about the same topic for 31 days. You can see the other categories at Nesting Place's 31 Day Kick-off Post. To kick off the series, I am offering my Making an Izannah Walker Doll PDF pattern for over 30^ off until midnight of October 2nd. So if you haven't purchased it,today is the day! Please share with your friends. Click the Making an Izannah Walker Inspired Doll banner in the sidebar to read more about the pattern. I will be adding links to each day's post in this post. I'm cheating a little bit by adding this one a tad early. Day 4: What Makes an Honest Doll? Day 8: Wash Your Fabrics!